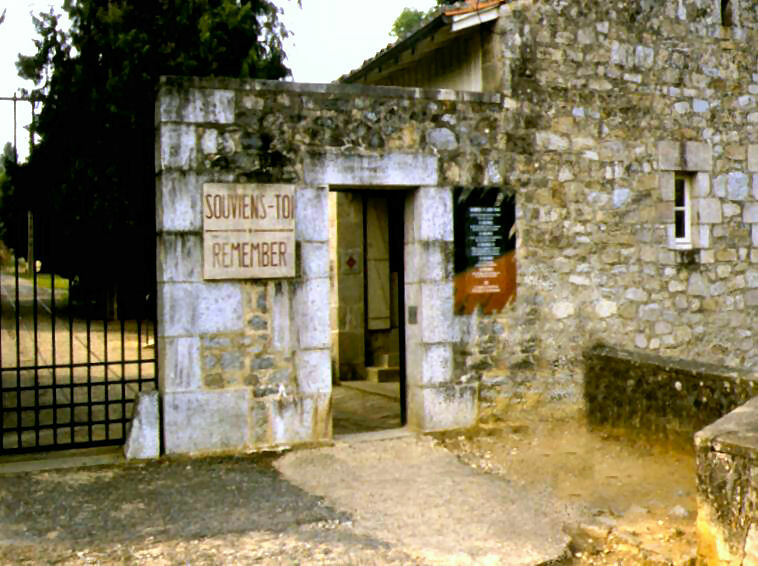 This is the old southern entrance to the ruins of Oradour before the Centre de la Mémoire was built; it is the route that the Soldiers used when entering the village. The small shop that sold memorabilia is visible through the doorway. The sign showing "Souviens-Toi : Remember!" is shown both here and at the northern entrance. At the present time the ruins are only entered by way of the new Centre. The bridge over the river Glane is about 25 metres to the rear of the photographer and the church is about 100 metres on the left after passing through the gate. The watermill is to the right of view, behind the shop. The tram lines can be seen through the gateway, heading up into the village.